The Amsterdam was an 18th-century cargo ship of the Dutch East India Company (Vereenigde Oost-Indische Compagnie; VOC). The ship sailed its very first voyage from Texel to Batavia on 8 January 1749 but got wrecked in a storm on the English Channel on 26 January 1749. The shipwreck was found in 1969 in the bay of Bulverhythe, United Kingdom, and is sometimes visible during low tides. Some of the findings from the site are in The Shipwreck Museum in Hastings. 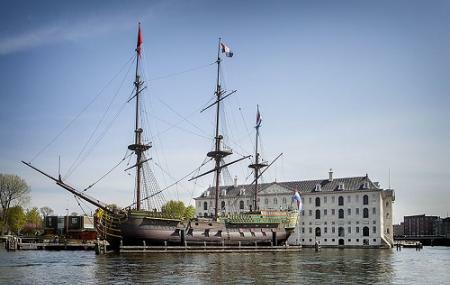 A replica of the ship is on display in Amsterdam. Though a replica, it's a surreal sight to see the ship standing in front of the museum. Explore Voc-schip Amsterdam and other prime spots of the city using Amsterdam trip planner. Oomph up your visit by adding the best hotels in Amsterdam like Lloyd Hotel And Cultural Embassy, Q-factory Hotel and Amsterdam Tropen Hotel. Find out how to reach Amsterdam to begin with. Plenty of wholesome Amsterdam vacation packages are available to choose from, pick your today!